CLEARWATER, FL.---Despite striking out 19 times, Dunedin picked up the 7-3 victory over the Clearwater Threshers in game two of the four game set. The Blue Jays tacked on an early run in the top of the second without a registering a hit. Demi Orimoloye and Ryan Noda drew back to back walks. Orimoloye came across to score the game's first run on an errant throw to third by Clearwater catcher Edgar Cabral. Matt Vierling tied the game for Clearwater with a solo homer in the bottom of the fourth. RHP Jonathan Cheshire was brought out of the Dunedin pen in the bottom of the fifth and surrendered the go-ahead runs courtesy of a Simon Muzziotti two run double to give the Threshers a 3-1 lead. Clearwater couldn't hold the lead for long as RHP Luis Carrasco struggled in his second inning of work out of the Threshers bullpen. Already having given up one run in the frame, Carrasco left a fastball out over the middle of the plate that was tagged for a two run double by Riley Adams to give the Blue Jays the 4-3 lead. Dunedin sent nine men to the plate in the ninth and scored three runs to put the game out of reach. Cal Stevenson drew a leadoff walk and was driven home by an RBI triple off the bat of Chavez Young. Two batters later, an infield single that traveled 10 feet in front of home plate off the bat of Orimoloye scored Young to make it 6-3. Later in the inning, Kevin Vicuna worked a two out, bases loaded walk to bring the score to its final of 7-3. Despite striking out 19 times on the evening, Dunedin drew 10 walks and have now been issued 14 free passes in the first two games of the season. 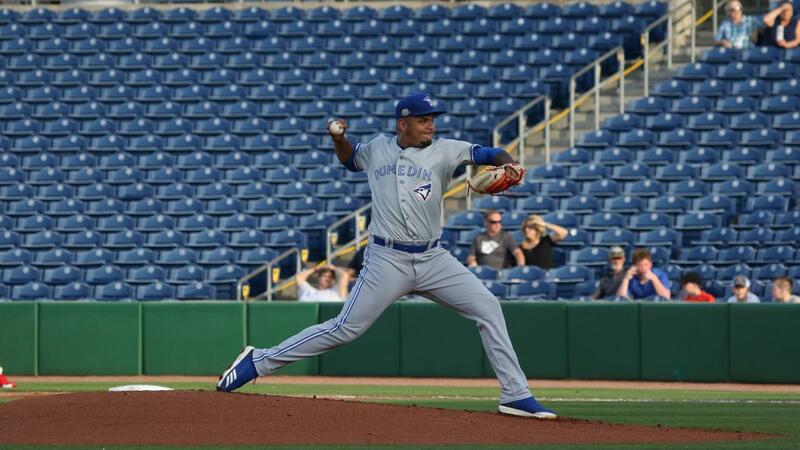 On the other side of the coin, RHP Maximo Castillo started and pitched four innings, with RHP William Oullette picking up the hold after throwing three scoreless frames out of the D-Jays pen. The series continues tomorrow night at 6:30 E.T. in Clearwater. LHP Nick Allgeyer (0-0, 0.00) makes his first start of the year for the Jays. He will be opposed by RHP Alejandro Requena (0-0, 0.00) for the Threshers. The game can be heard on the Dunedin Blue Jays Baseball Network, powered by TuneIn Radio.